The spoils of this year’s Champ of Champ Athletics competition belong to Savai’i. Yes, athletes from Vaiola College, Don Bosco and other schools took a ferry, a bus and then they shocked the competition at Apia Park yesterday by dominating with a number of new records. The Girls division was a hotly contested competition. 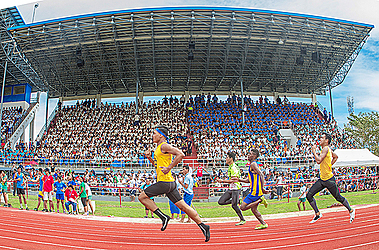 Pesega College topped the Junior Girls, while Channel College won the Intermediate girls division. The senior girls division saw another school from the Big Island of Savai’i running away with the top spot, Don Bosco College in Salelologa. The boys division saw an exciting contest. Wesley College at Faleula topped the boy’s junior division, with Vaiola College prevailing in the Intermediate Boys division. Avele College claimed the Senior Boys division. There were numerous new records recorded by the officials. “One difference from last year to this year, is the increased number of new records recorded,” said To’a Tuavetititoa, President of School Association. He congratulated all the students involved – especially the students from Savai’i. The competition will help the Samoa Athletics Association to identify young talents for the upcoming Mini Games in Vanuatu later this year. Kalvin Masoe of Vaiola College won two gold medals yesterday, claiming the 100m and 200m race. Kolone Alefosio of Avele College also won gold medal after winning the 110m Hurdle’s race with a new record recorded. Another highlight of the competition was the cheer and support of all the schools. The atmosphere in the park was absolutely amazing, with students creating the atmosphere with good humour and lots of singing.